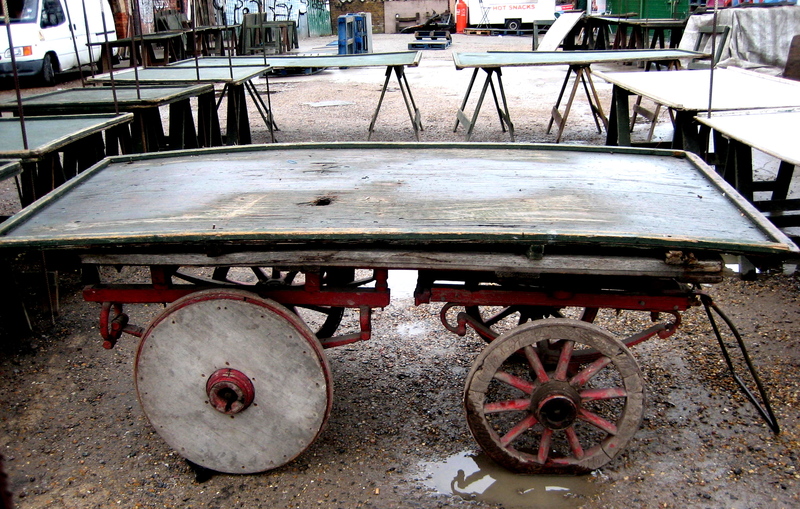 When I saw the wooden carts and barrows in Mark Jackson & Huw Davies’ pictures of the Spitalfields Fruit & Vegetable Market, I realised that some of these old-style barrows have been sitting around in Sclater St for the past couple of years, used in the Sunday market and quietly rotting for the rest of the week. My eye was drawn to the wooden wheels, every spoke individually chamfered, an attention to detail that recalls those magnificent gipsy caravans of a century ago. There are still plenty of these barrows in use around London, from Portobello, Berwick St, Seven Dials, Leather Lane, Chapel Market to Roman Rd, though now they are relics of another age. I asked Paul Gardner whose family have been trading as market sundriesman from the same building in Commercial St since 1870, if he could tell me anything about these carts. He recalled there was a company called Hiller Brothers that manufactured barrows in Bethnal Green and a wheelwright who repaired them in a workshop under the Bishopsgate Arches. And he had some phone numbers, which he called to seek further information but both numbers were discontinued. You find these barrows and carts in museums and sometimes in gardens with Lobelia and Geraniums trailing out of them but I prefer to see them in use, though without wheelwrights to mend them their days are numbered as the makeshift repairs to the wheels of the Sclater St examples testify. 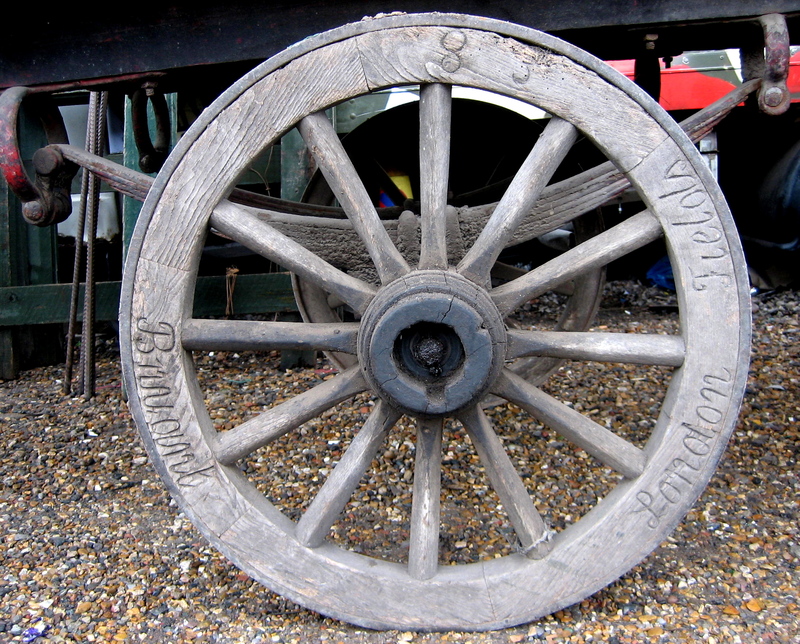 These wheels are a smaller version of cartwheels that were once standard when all street transport was horsedrawn, sustaining the attendant wheelwrights’ and cartwrights’ trades. That afternoon, I was walking through the empty Leather Lane Market where I came upon a couple of these barrows. Trading had ceased for the day, so I was able to squat down and take a closer look. I discovered incised lettering in an elegant italic hand that ran along all sides of the barrow and in some cases around the wheels too. The name and location of the market “Leather Lane, Holborn” plus the manufacturer and the status “On Hire.” To my surprise I came across the name “Hiller Bros” and an address in Bethnal Green, “64 Squirries St,” just as Paul Gardner told me. 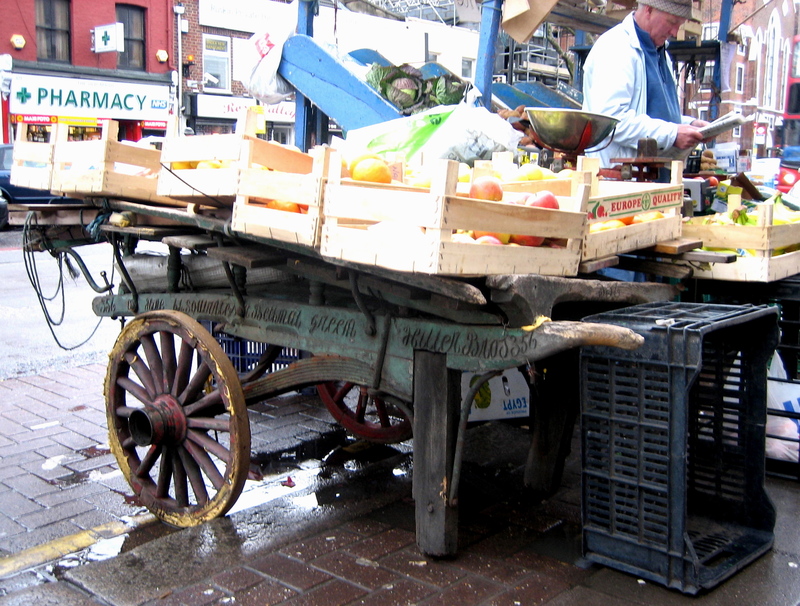 I photographed a fine market porter’s hand cart in the Bethnal Green Rd Market, loaded with fruit and vegetables for sale. Paul Gardner remembered that all the local greengrocers had these to wheel down to the Spitalfields Market and collect their fresh stock daily. Years ago, he traded a trolley from his shop with an old man from the market in exchange for a huge handbarrow with heavy iron wheels that now sits in his back garden. Examining my photo of the hand barrow in Bethnal Green, I saw it was also incised with the name “Hiller Bros” and when I did a google search I even got a phone number though, to my disappointment, it no longer functioned. So I decided to take a walk up to Squirries St, but first I took a detour to Hoxton where a friend lives in the former Lambert timber warehouse in Hoxton St and here I was able to photograph the cart which has been disassembled but stored safely under a lean-to in the yard. This one is remarkable for remaining in its premises and for its beautiful signwriting – and again I saw the incised italic script that is the standard means of identification for these carts. The script resembles the handwriting of a century ago and I wonder if once someone simply wrote in chalk along the side of each barrow and someone else followed along to carve it out. 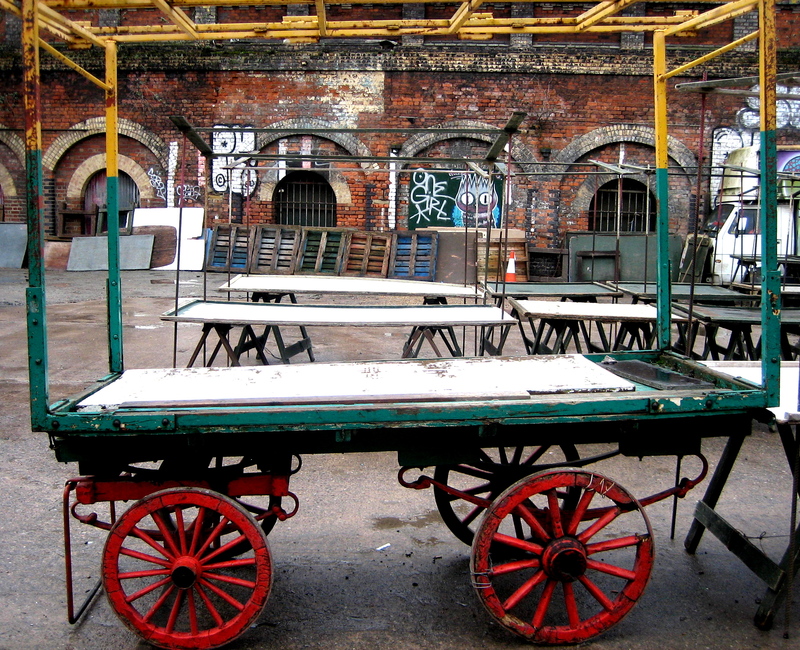 Returning to Sclater St and squatting down to read the inscriptions on these carts, I learnt one was a stray from London Fields, eternally “On Hire” from Leach Bros. Arriving at 64 Squirries St, just off the Bethnal Green Rd, I found an unremarkable locked-up building without any signeage beyond its street number. It was padlocked from the outside, so there was no point in knocking and I could not discern any sign of recent activity. Like some frustrated detective, I was deliberating my next move when I noticed there was a small glass panel (no bigger than a postcard) in the tall steel shutter closing off the yard and I peeked through the dirty pane to discover the picture you can see at the end of this feature. 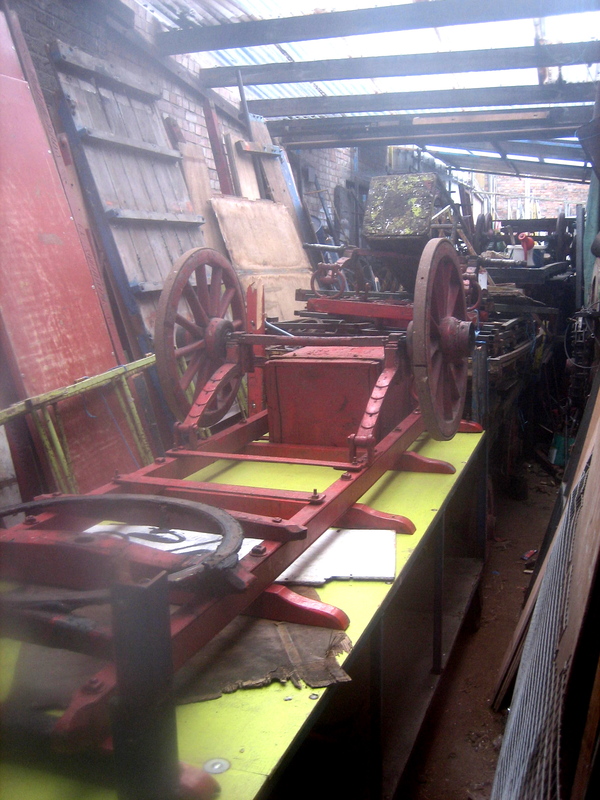 I wiped the glass on the outside with my handkerchief and took a hazy photograph, filtered by grime, of broken carts in the abandoned workshop that was once the centre of a thriving trade. Please do not tell anyone about this glass panel in the steel shutter, because no-one wants lines forming on Squirries St to ogle the charnel house of carts and barrows. Let us not collect all these carts and put them on display. It can be our secret. As long as they are around we can be gratified to see them disregarded on the street, demonstrating stubborn longevity. Injecting a little arcane poetry into any unremarkable cityscape, they are vestiges of when the world was driven by horse power. Now I have made my discovery, I will take a closer look at each specimen I find and read the inscription to discover who constructed it and for which market – as a mark of respect to those craftsmen who were so skillful in making elegant functional things with their bare hands, still in use today when they are long gone. I’ve heard of the mysterious elephants’ graveyard, but one for barrows? But maybe it is instead merely a way station, and those disassembled carts will one day, phoenix-like, rise again. The history that lives on, but only now revealed by a keen eye and curious mind. Again, I do thank you for acquainting me with a topic that I did not previously think about, but now, because of your post, will. Form and function. It’s a pleasure to see designs that definitely did serve a function in the past, and still function now. As our current history seems to thrive on speed, and sell by dates, I wonder who might be championing what’s new and around now … in say, fifty or one hundred years. Growing up in Spitalfields there was a Mr Holt who worked (and lived) in Wheler Street making and mending barrows for the Spitalfields Market. The firm was called E.Howard & Sons (coster barrow manufacturers)and Mr Holt worked there for 30 years or so. The family lived over the workshop and as children we would sometimes play on the flat roof over where he made the barrows. The barrows were beautiful. Very simple but efficient for what was needed. This is an inspiring piece of research. As a direct decendent of George Hiller, a cabinet maker and my Great, Great Grandfather I can reviel the history of these hand carts. His sons where respectively one a wheelwright and the other a cartwright aprentices. To deliver the cabinets George made (one of which I am looking at right now in my Kitchen) George got his sons to build him a hand cart or two. The market traders of the London Markets were so impressed that they asked if they too could have hand carts of such quality. Well the Hiller Brothers were so shrewed they did not sell the carts but rented them out to the Market traders, and Hiller Bros was bourne. The family arms have lost contact, but I know until the 1990′s Hiller Btros were still in the business of leasing out market stalls to the london markets. My Mother is the font of knowledge on this subject, so please ask if your interested and I’ll try to dig the detail out. i’ve been harrassing hiller’s lot to change the wheels on my barrow coz my back hurts, now you’ve got me thinking i’ll struggle along with it just for the sentimental value, you can see mine on my site: abzcomputers . com, scroll down to the bottom, it’s got one of those ancient discs on the bottom that weighs a ton. I remember these carts in Surrey Street Market in Croydon when I was a child in the 50′s & 60s. I loved them, the wheels, the lettering, the colours they were painted and the lights, lots of light bulbs strung up and across the stalls making them and the market a magical place especially in Winter when it got dark early. The stallholders were full of character, and often made me laugh. I will always remember one, holding out a container of carrots and shouting ‘rhubarb, rhubarb, bootiful rhubarb’ . Tickled me when I was 10, tickles me now I am 62. … and remember the copious amounts of artificial ‘grass’, showing between the boxes of fruit and veg and hanging down the front of the barrow. It all looked so exotic and tempting. Magical memories. Pleased to see someone taking an interest in these relics …….. and I’m delighted that the two wheeled cart at Lambert’s is still there. I bought that building about 30 years ago from the Coronet Timber Co of Hoxton Street. Included in the purchase were their hand cart and their Bedford lorry both of which we used in our business. I sold the hand cart together with the building in 1989. We still have a costermonger’s barrow which occasionally goes for an outing round Vauxhall to the consternation of motorised road users. Great site, I am researching the history of the New Cut Market in South London; one family firm that crops up over there is Tappy, Joseph started in 1910 and the firm was still going in the late 80′s. I am interested in any information that anybody might have on the family of the Tappy’s; please get in touch if you have any. Have recently bought one of these amazing hand carts and am curious if anyone has any knowledge of the registration numbers and businesses that are engraved? The cart is in exceptionally good condition and am looking forward to restoring it to its original condition and would like to find out as much as possible. Are records kept of these carts and what would have been the original colours? Any help would be greatly appreciated so we can keep our history alive. Many thanks. I have a wheelbarrow which is I believe is a costermongers barrow. It is in a very sad state of repair and I was wondering if anyone would like it to restore to its former glory? I live in Brighton, Sussex. However, recently, my father made me a handcart based on a London style and I have been painting it up along with the second hand wheels (on hire from Leach Bros!). It is nice to find these pages! would anyone be kind enough to lend a barrow or two which would be lovingly looked after for the night of the 6th November 2012. We are holding a Charity event at the Inner Temple for fund raising for CANINE PARTNERS. This wonderful Charity helps change the quality of peoples lives who have been disabled though illness, war etc. The dogs are trained from birth specifically for each persons needs that they partner. it would be our dream to be able to use a barrow or two for display purposes only. Lovely site – and very informative. I have 2 carts which were presumably orignally hand barrows but now have shafts added. They are pulled by my donkeys and I take part occasionally in the London Harness Horse Parade with a donkey taking the fish barrow. My dad renovated it, and it has ‘for hire’ and Billingsgate’ carved in the wheels. I now own the worlds’s largest cloolectiobn of plastic fish which I use to fill baskets when out in a parade!!! I have two more, awaitning renovation – one has a metal coveirng and two big ‘clamps’ on the sdies. I was told it came from Smithfields and the metal clamps were to hold the sides of meat on. Sounds pluasible. I would dearly love to have them all in good working order, the take all of them to the Harness Horse Parade – one for fish, one for flowers, one for fuirt nad veg and one for meat! .. one day maybe. If there is anywhere else I can do any research o nthem, please share! To follow on from Frazers contribution. I havebeen trying to find out what happened to the business. My cousin Robert Hiller was the last person to own the business but I and the rest of the famiy lost touch with him since his mothers funeral in the eighties. as far as I know it was still going then. It is sad to think that it just faded away. Robert qwould be 76 or 77 now and I have been trying to find him but have no luck so far.Maybe he is dead and I know he had no children. The business was originally in James street where I remember as a child going to the work shop and watching the steel band put in the fire and then round the wheels. They later moved to Squiries St. which had previously been a dairy where they had previously actually kept the cows in stalls which they then used to store the barrows. They never sold any barrows or the subsequent stalls. My uncle Leslie used to collect the rents on Saterday mornings from most of the London Markets and Street Corners they paid 2/6 per week .so he had very heavy bags of silver from which he paid my grandmother her pension, as a result she never trusted paper money and was very reluctant ot change a 10 bob note for me and felt she had given me the money and she never spent the note. We foun d several of them in her dressing table drawer when she died. I AM VERY LUCKY TO Have an original barrow. Lovely to see someone else looking at the old stalls. My brother Ron & I worked for Bob Hiller whilst still at school. We looked after the London Fields end of his ‘empire’, having previously worked for Johnny Bryant. 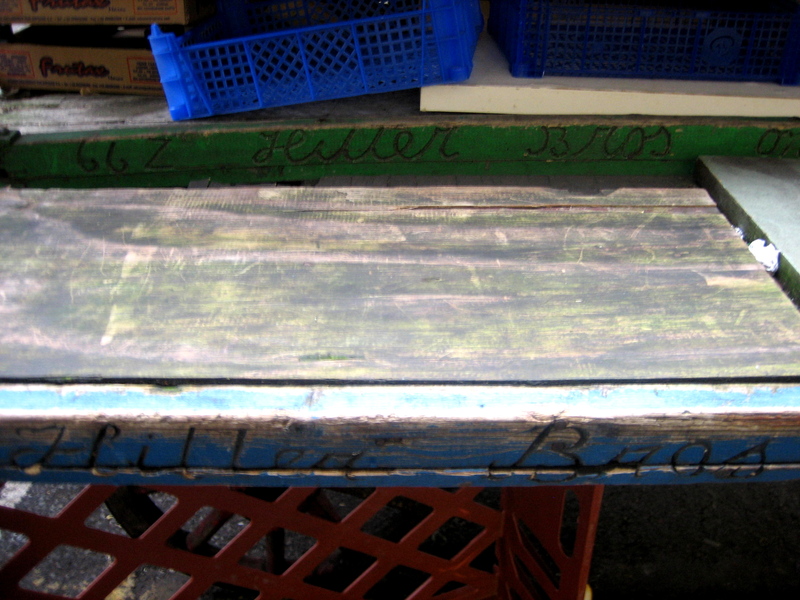 The stalls were painted, in the Bethnal Green shop, by an old boy called Albert & always in the distinctive Hiller colours. I found it sad when they went over to the tubular iron stalls but am happy that some are still in use in Leather Lane, with my brother’s hand writing on them. It was he who welded/soldered the “Hiller Bros – On Hire”. I have a completely original Costermonger Barrow. It says on hire w.j. everett ltd. 165 drury lane, wc2 inscribed all over it. Its in mint condition. Please help as trying badly to locate its manufacturer and owner etc. Looking to buy a market barrow can anyone help me where to find one . 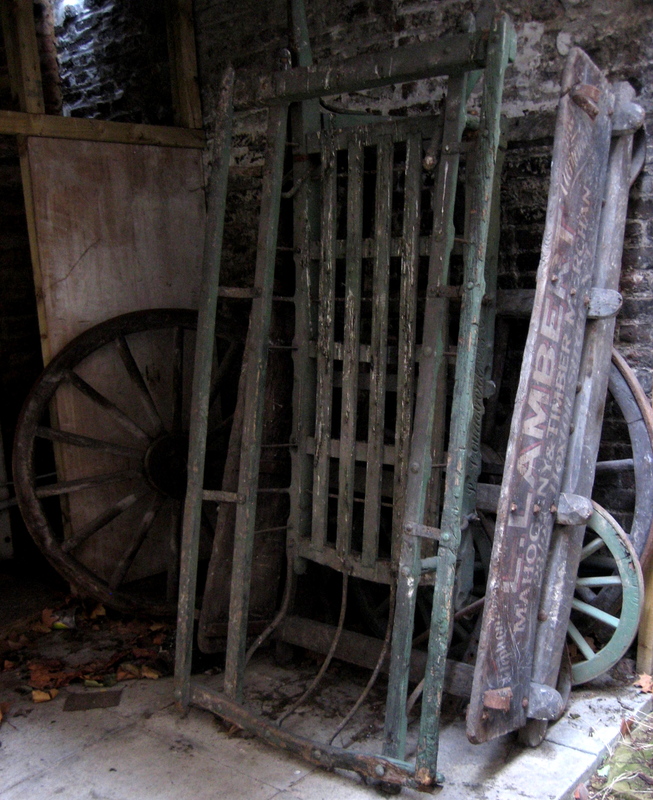 I have an original , wheeler st barrow that I may be interested in selling? Two wheeled barrows were market porters barrows used to deliver produce from spitalfields shop or stand to the back of someone’s lorry / van . You used too load your barrow in a way as to counterbalance so you can pick it up without tipping it up if you managed to tip it up it was called a shoot and you would damage the produce on the floor / you could get around 50 boxes of oranges on a barrow if you loaded it right you just called for a hand if you struggled to get up a hill, there was always a helping hand. There are two on eBay right now..
Hi, I’m so pleased we found this site. These barrows are fab and have so much history. We have an original 2 wheel barrow but due to a house move, we need sell it on. The name on the wheels are C.G.C. Ltd No 2. It needs some TLC, but its in decent condition. Some wood needs replacing or repair, but its a lovely barrow. If you know anyone who would like to buy it, please let me know. Unfortunately we don’t have the room in our new garden for it which is a shame. We used it as a flower display. Number is 07711669827. I might be interested in buying your cart. Hi, this is mainly aimed at Trevor Williams who posted back in December 2011, but if anyone else can help please get in touch! I’m the CEO of Brixton Market Traders’ Federation CIC and we are looking to restore our last remaining traditional wooden market barrows and flat (feed) barrows back to their former glory. We have 8 market barrows and 6 flat barrows in use….when I started trading in Brixton street market there were 60 or more! I found this site whilst trying to find pictures of the carts to show my father. He has altzheimers yet still talks fondly of the old family buisness. I am amazed that so many people also have fond memories of them! Thank you so much for posting these pictures he enjoyed them very much and the memories brought a tear to his eyes. I belong to TfLISHG (formerly the London Transport Industrial Archaeology Group) and one of our members some time ago wondered at the history of these venerable carts. What a fascinating subject – great website! I’ll have a closer look at those in our Surrey Street market in Croydon, which date back to the dim and distant. 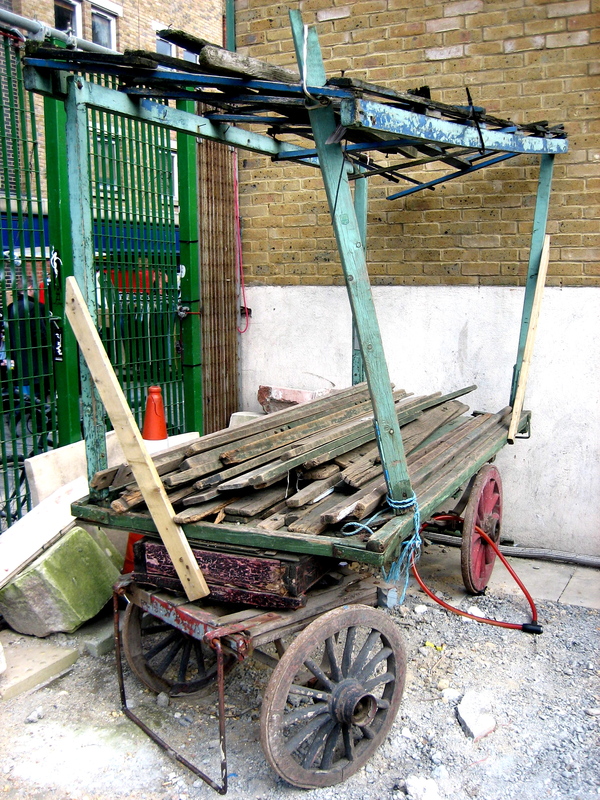 My sons partner has a genuine costermongers barrow for sale which shows “Caledonian Road N7 on side. It is in reasonable condition and has all original leaf springing. I have pictures which I can e-mail if anyone has a genuine interest. Price would be around £900-00 – £1,000. approx. My telephone number is 07745 989298. Only serious offers, please. The “Caledonian Road barrow” above is no longer for sale, PLEASE DO NOT RING NUMBER SHOWN. Thank you. What a delight this page is. I was idly looking to see if Hiller bros still existed as I have a blue 4 wheeled barrow (which I read here now where market stalls). It has writing on all four wheels too. I have really enjoyed reading about the people that that made, painted, inscribed and used them by their families on here it has really brought the barrow to life. My mother a Londoner who loved the east end markets bought it in the 80’s when she moved out of London. It is as bought but could do with a good clean up but it is in good condition including the wheels for it having been left outdoors (and worked so hard in its hey day) but under cover for the last decade or so. Thank you everyone for taking the time to tell us the history of these beautiful examples of craftsmanship. My Grandad owned Leach Bros and used to make and maintain the stalls and supply to lots of the London markets, (his stalls were used in the film Oliver). I am trying to find one for my Dad and would appreciate it if anybody knows where I can find one, even if still in use. My Grandads yard was vandalised and burnt down back in the early 80’s, not insured and no prospect to get back up and running he died 6 months later. NB. Should anyone reading this wish to buy a barrow then simply email me to express your genuine interest and I will get back to you with the prices and pictures. I currently have one of these barrows for sale, almost identical to the one in these photos.